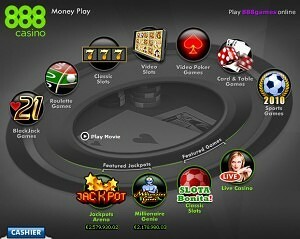 888 Casino is a part of the Cassava Enterprises, which is one of the largest online gambling companies in the industry. The company offers poker, sportsbetting, bingo and casino services to millions of clients worldwide. Custom created games, generous treatment and constant innovation are the things that could be used to describe this company. If you’re looking for some truly unique games, 888 casino is a great place to play at. Software is well built and more importantly, it supports a wide range of platforms. You’ll be able to play all the casino games in two versions – downloadable and instant flash version, suitable for those that like to play from anywhere in the world. The software is also fully MAC compatible, meaning that if you own an Apple device, you’ll still be able to experience the same gaming environment. Mobile and tablet users aren’t forgotten either by developing a mobile casino that allows players to play several dozen games directly from their devices. Both Android and iOS are compatible with the software. As the casino is powered by several of the top providers, the variety of games offered is quite impressive to say the least. Hundreds of titles for slot games as well as several variations of the most popular table games, including roulette, blackjack and others. Millionaire Genie – a 3 reel, 1 pay-line classic slot game that might sound boring. However, it offers some unique features with the most notable being a 7 figure progressive jackpot. Cleopatra – a popular slot machine created after the queen of ancient Egypt. It offers action over 25 pay-lines, a scatter and wild symbols. The Incredible Hulk – a 50 pay-line slot created after the Marvel Superhero from their comics. Enter several bonus games and win one of the progressive jackpots. Monopoly – have you ever played the worlds most popular table game? 888 has turned it into an entertaining slot machine featuring 5 reels, 25 pay-lines and several bonus games. The X-Factor – a popular slot game created after the popular TV show for new artists. Enhanced graphics and visual elements and an unique bonus game. On top of the normal or most common games, you’ll also be able to find some more ”exotic” games. and more! Visit 888 Casino for more games. 10% bonus up to $100 during Happy Hour events every month for the next 12 of them, that’s $1,200 in extra bonuses! Both offers feature the same wagering requirements – you will have to wager 30 times the bonus amount, before a withdrawal can be requested. If you happen to run into any issues, there are a couple of ways to get in touch with an agent or representative from 888 casino.